A few weeks ago, MovieGlu reported rumours that Compare The Market were planning to replace the Orange Wednesday 2 for 1 offer. Well, Compare The Market has today put more information on its website telling us a bit more about what’s happening – and is calling it Meerkat Movies. The new programme will be a 2 for 1 cinema ticket offer available every Tuesday and Wednesday from 3rd April. If you buy a qualifying product from comparethemarket.com, you’ll be able to use the offer for a whole year. Qualifying products include: Car, Bike, Van, Contents, Building, Contents and Building, Pet, Life, Landlord and Travel Insurance, Energy, Broadband, Home Phone, Digital TV, Credit Cards and Loans. The final “Orange Wednesday” was on February 25th and was introduced in 2003 by the mobile phone company Orange which later merged with T-Mobile to become EE, Orange Wednesdays ran a campaign with selected UK cinemas where customers could claim a 2 for 1 ticket offer by sending a text message. Thinking about going to the cinema this week? 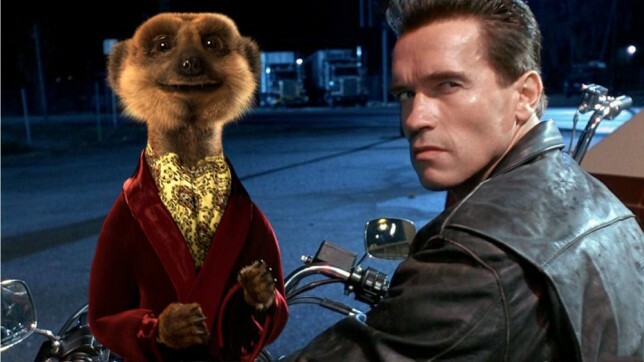 In February, reports emerged that former “Terminator” star and California Governer, Arnold Schwarzenegger would be joining Compare the Market’s famous Meerkats in a new advertising campaign – this has yet to be confirmed. This entry was posted in Uncategorized and tagged cinema, Meerkats, Tickets by MovieGlu. Bookmark the permalink.